Identification: This is a plump, soft-bodied dorid with compact gills. 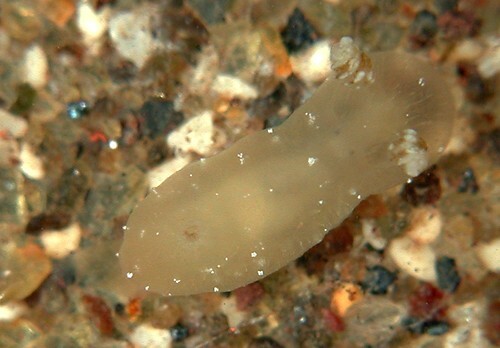 The rhinophores are mottled in brown and white. There are two color forms: violet-brown with few to no white flecks and cream with numerous white flecks. The white flecks are on minute papillae. Natural history: Hallaxa iju is a moderately rare species known from seven animals, four cream and three brown. It has been found in moderately protected to exposed rocky habitats, as well as Halimeda kanaloana beds, at depths of 4-8 m (13-26 ft). Both of the animals found in Halimeda were brown. A cream, spiral egg mass 4 mm in diameter was found on algae in a holding dish containing a cream, 4 mm animal. Distribution: Maui and Pearl & Hermes Reef: widely distributed in the western & central Pacific. Taxonomic notes: There's some possibility that the two color forms might be different species. (Note 1) It was first recorded in Hawaii from Kapalua Bay, Maui by CP on July 1, 1996. Photo: CP: 3.2 mm; cream: Five Graves, Maui; Aug. 13, 2002. Note 1: Animals from the western and central Pacific vary from light to dark brown with a variable number of white flecks. Both background color and the number of white flecks appear to intergrade through the range of variation. In contrast, both Hawaiian and French Polynesian animals fall into the two discrete forms described above without obvious intergrading. Perhaps, this indicates that the lineage has split in the eastern part of the province?